BBG’s BUGs are out! Brooklyn Urban Gardeners, that is. The first class of BUG—BBG’s new program to train community greening volunteers—has put its newly honed skills to good use. Graduates of the eight-week program received their BBG certificates last January and soon dug into creative and collaborative projects all around Brooklyn. Our next class of BUGs graduates in January 2012. Watch for BUGs in your neighborhood! Or better yet, learn more and apply to become a part of this growing group of committed community greeners. Nina Browne is the community program manager at Brooklyn Botanic Garden. She is a certified Brooklyn Urban Gardener (BUG), tree steward, and citizen pruner and has undertaken such projects as organizing the school garden at her children’s public school in Fort Greene. She earned her MA in urban anthropology from NYU and a BA in cultural anthropology from Barnard College. 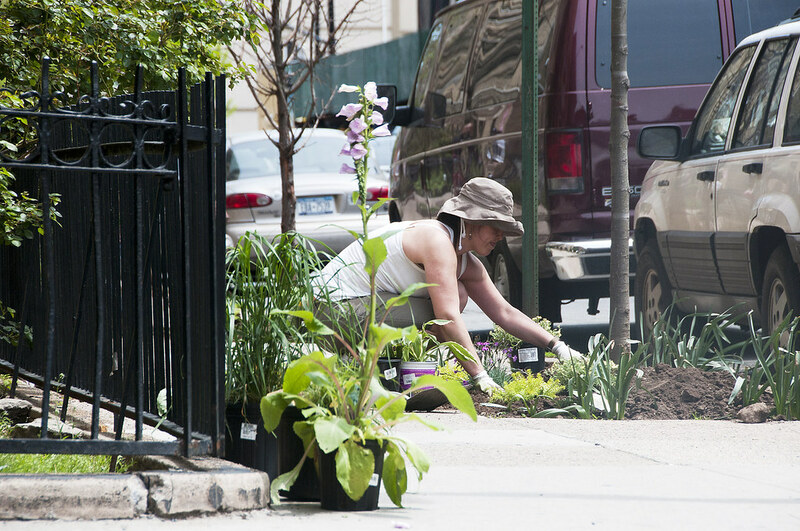 Inspired by BUG, Coquille Houshour’s neighbors improved tree beds in Crown Heights last spring. Photo by Mustafa Onder.